This sweater from Madewell is the front runner for my favorite sweater of the season. It’s the perfect medium weight and I love the pockets on the front. It also comes in a muted pink that I would’ve bought if I didn’t already have one in a similar shade. I wore this outfit to an impromptu dinner with Seb - we finally found a good Mediterranean option near our house! It’s a miracle I made it out without hummus or tzatziki on it, but totally worth the wear on one of the first truly chilly nights in NC. 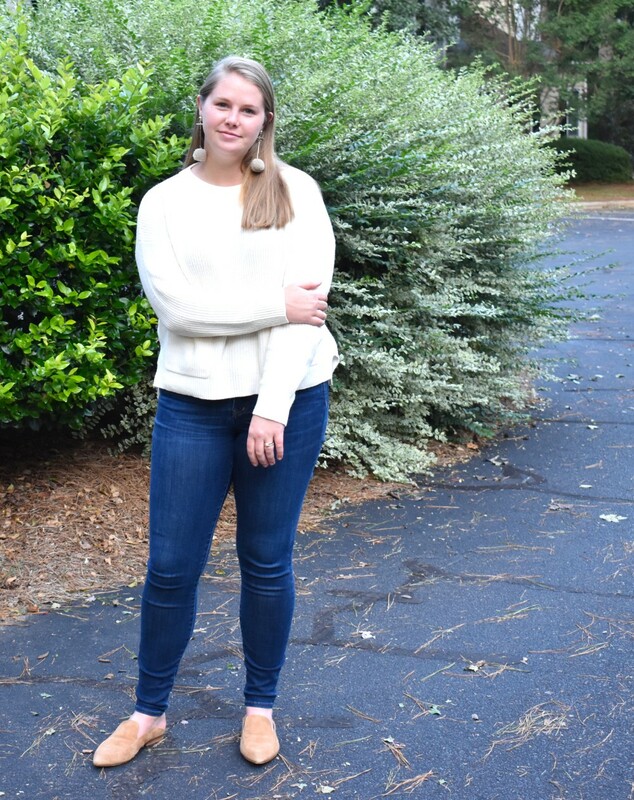 Jeans + simple sweater is by far my most worn combo in the fall and winter. Since the temperatures are still bearable right now, I’m getting as much wear out of my mules as I can, but my favorite boots from last season will surely make an appearance soon. And these earrings are the perfect combo of neutral + fun (similar pair here). They definitely make the outfit more interesting without taking away from the simplicity. What’s your throw on combo for a simple outfit?